Greenkey Rolling Lawn Aerator 30cm lawncare kit provides a garden tool for deep even aeration of lawns. 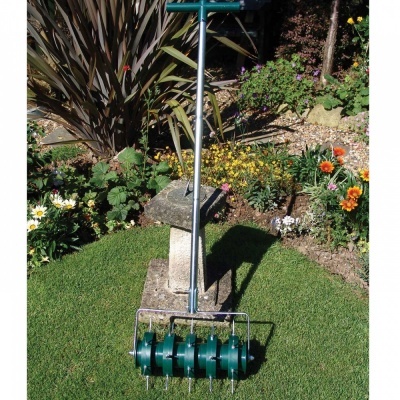 Promoting good healthy air circulation and sunlight to reach the depth of lawn roots, the Greenkey Lawn aerator contributes to a desired dense and lush lawn. Lawn aeration is beneficial at any time of the year, even in winter. Thirty 45mm deep fixed rolling spikes dig in easily and smoothly without jerking whilst rolling the lawn area. T-Bar handle with comfort grip is provided for ease of use when pushing the roller across a lawn. Large 30cm (12") roller width ensures lawn area is covered quickly.